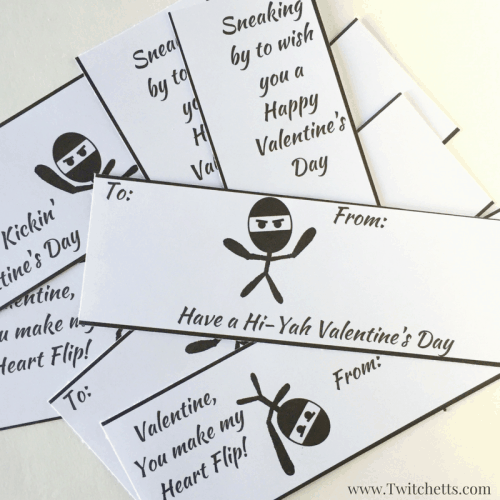 Ninja Valentines – Printable Valentines for Boys and Girls! 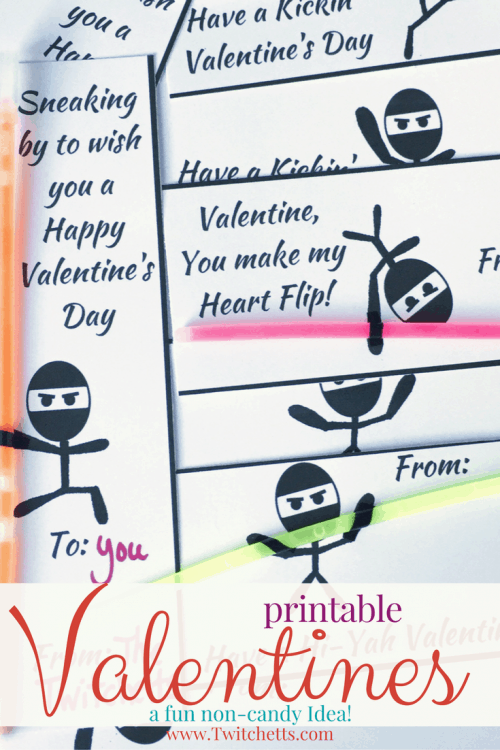 These ninja Valentines are the perfect printable valentines for boys and girls. 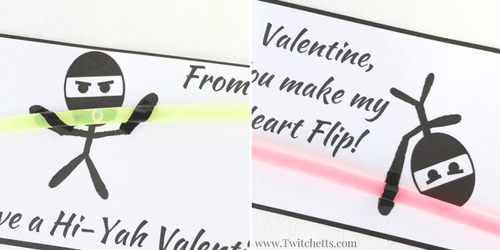 Add a glow stick and you have a perfect non-candy Valentines Day card that’s not overly mushy! 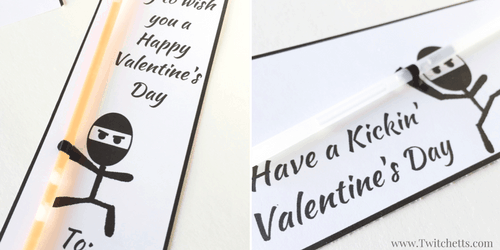 My son doesn’t want anything “mushy” to give out to his friends… These Ninja Valentines are not only cute and clever, but they are also non-candy Valentines which I prefer to have my kids pass out! There are so many reasons I try to come up with a non-candy Valentines each year for J to pass out. They get too much candy for everything these days, but there are also a lot of kids with allergies that can’t enjoy the candy. We do the Switch Witch and Teal Pumpkin Project for Halloween and this is our way of being conscious for Valentine’s Day. Also, these Valentines were really “cool” to pass out last year. I mean what kid doesn’t love ninjas? Most of the Valentines can be given to friends without saying anything “gushy” and all kids love glow bracelets! 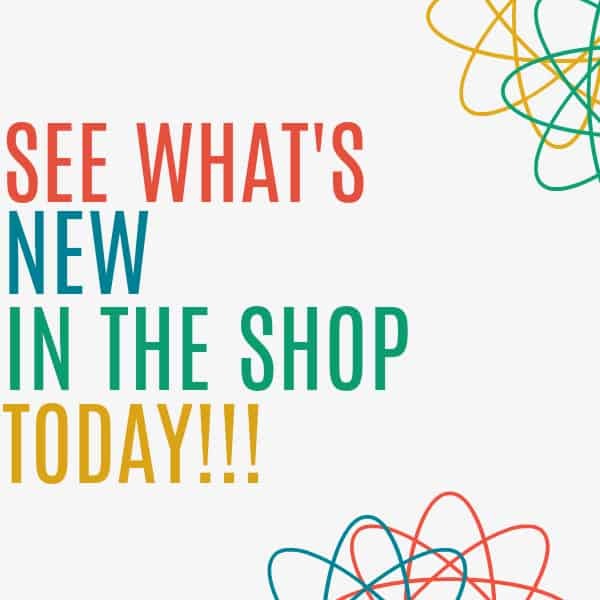 Click here to grab your printable! You can print off as many as you need! 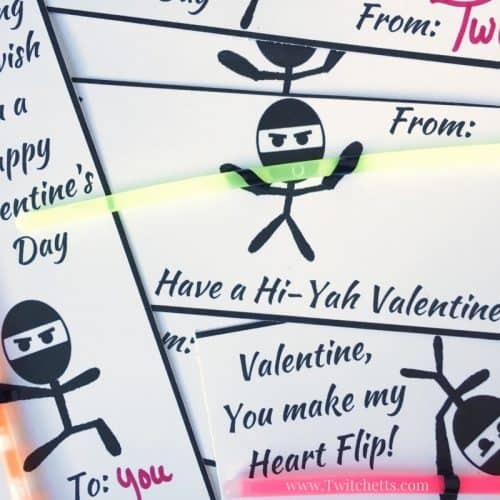 Get all the supplies you need for these ninja valentines in our Amazon shop! 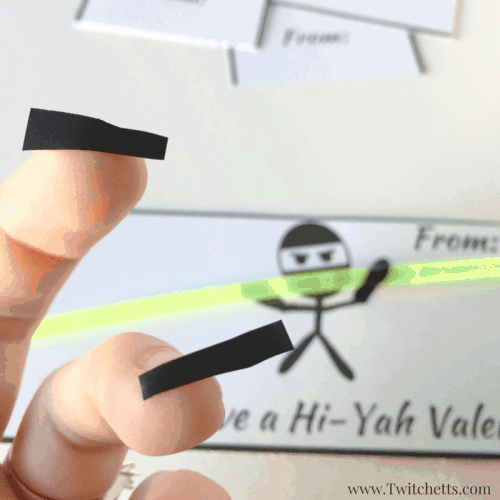 Cut out your Ninja Valentines. Use black electrical tape to attach your glow bracelets! It has a little bit of stretch to it and the width of the tape is perfect for wrapping around the glow bracelets. The tape will look like extensions of the arms and will blend in well. If your child is younger and might be a little more rough with them you can also add a dab of glue under the glow stick before adding the tape. Just make sure to allow them plenty of time to dry! That is it! You are finished. These are really easy to put together and are fun for your kids to pass out! They were definitely a success after setting the bar pretty high with last years ‘Bead My Valentines’. Let’s face it, coming up with a non-candy Valentine for boys and girls can be tricky, but we are up for the challenge!